Per Quine's results from "Two Dogmas of Empiricism", the Duhem-Quine thesis, and later results such as those of Kuhn and Feyerabend, all empirical observations are theory laden. Even widely accepted facts such as the Earth is round or the Earth revolves around the Sun are dependent on theories and presuppositions, and any theory can be supported by any set of facts provided additional auxiliary hypotheses are added to reconcile them with each other. But then if no clear cut epistemic method can differentiate between Einstein and Newton or Ptolemy and Copernicus, how can we ever be able decide competing debates about various social issues and science related social debates? If facts cannot clearly decide in favor of one theory over the other, then doesn't everyone become truly entitled to their opinion? Consider various contemporary debates such as climate change or the debate over the relationship between vaccines and autism and other diseases: There is broad scientific consensus that climate change is real and vaccines do not causes autism, and anybody who denies these facts is considered to be unscientific, ignorant and deserving of mockery and derision. But, if Duhem-Quine and theory ladeness of facts hold, then climate change deniers and anti-vaxxers are perfectly entitled to their opinion. As long as they come up with a suitable set of presuppositions, then no set of facts can ever prove them wrong, and accusing them of being irrational or illogical is disingenuous and unfair. The situation would be made even worse when trying to discuss facts about social sciences and policy. If facts cannot decide in favor of one theory or another, how are any discussion about ethics or the effects of policy on society ever possible? If a far right nationalist party wants to make some farfetched claim about how immigrants are destroying society and corrupting our pure innocent women, nobody can accuse them of being irrational or crazy, they can always base their worldview on a set of suitably chosen presuppositions. How can one argue against climate change deniers and antivaxxer and other extreme and potentially harmful anti-science views, given the Duhem-Quine thesis, theory ladeness of facts, and the underdetermination of theories by data? Given the above mentioned results from philosophy of science, how are factual and logical debates about social and political issues possible at all? Isn't it the case that nobody can ever be wrong about their political and social views? Is there anyway out of such relativism? A clarification based on some of the answers I've received: I'm not looking for the psychological factors that cause people to hold such beliefs, or a pragmatic method of dealing with them. I am asking about the epistemic grounds for refuting them and considering their views invalid, given the underdetermination of data, although obviously there could be overlap between such epistemic justification and the pragmatic solution to dealing with them. Lloyd, Elisabeth A. 2015. “Model Robustness as a Confirmatory Virtue: The Case of Climate Science.” Studies in History and Philosophy of Science Part A 49 (February): 58–68. doi:10.1016/j.shpsa.2014.12.002. Leuschner, Anna. 2015. “Uncertainties, Plurality, and Robustness in Climate Research and Modeling: On the Reliability of Climate Prognoses.” Journal for General Philosophy of Science, July. doi:10.1007/s10838-015-9304-x. Brown, Matthew J., and Joyce C. Havstad. 2017. “The Disconnect Problem, Scientific Authority, and Climate Policy.” Perspectives on Science, January, 67–94. doi:10.1162/POSC_a_00235. You bring up an important issue for philosophy of science. A rough picture of how science functions something like this. A theory is formed that makes hypotheses or predictions about the world. Evidence is gathered that could corroborate or refute the hypotheses, and from that the theory is either supported or shown to be false. One problem, however, is that there may be skeptical doubt about the evidence. In order for the evidence to count for anything, it relies on auxiliary hypotheses or reasonable assumptions about its nature and how it was acquired. If I am performing a experiment to decide the half-life of a medicine in the human body and I find that it is typically around two hours, I need to make some assumptions. I need to assume that the test that I used to test the blood was accurate, that the blood I tested was actually from the patient who recieved the drug and not mixed up by a sloppy doctor with another patient's blood, and so forth. If I am presented some evidence that if true would falsifies my hypothesis, there are two logically valid moves I can make. I can reject my theory, or I can reject an auxiliary hypothesis. Often, in the face of evidence that shows that vacccines are safe or that climate change is real, the anti-vaxxers and climate change deniers deny an auxiliary hypotheses. They find reasons to discredit studies, often pointing to auxiliary hypotheses. This is a common move among creationists and those who hold that strict literalist interpretations of the Bible are consistent with scientific evidence. Per Quine's results from "Two Dogmas of Empiricism", the Duhem-Quine thesis, and later results such as those of Kuhn and Feyerabend, all empirical observations are theory laden. You missed Popper who pointed this out in 1934 in "Logic of Scientific Discovery". I think the relevant chapter is Chapter V. And Popper is better on this issue than Quine, Feyerabend and Kuhn. I'm not going to say anything about the specific examples you cite, but rather consider only the general issues involved in discussion. The fact that observation is theory laden does not imply that disagreements are unresolvable. Some explanations are not compatible with facts, logic, laws of physics and so on. The appropriate way to approach discussion with anyone, including people your disagree with, is to follow this motto: "I may be wrong and you may be right, and by an effort, we may get nearer to the truth". You should do this partly because it is hard to discuss ideas you're not willing to entertain and partly because you may actually by wrong, even about ideas you think are obvious. In fact, you are often most in danger of being wrong about anything you think is obvious. One further note. It is very common for people on both sides of some debate to be wrong. It is currently especially common for both sides of a debate to claim the "authority of science" when talking about a subject that has very little to do with science, such as political economy or morality. You should be on the lookout for this tendency in your own ideas and in the ideas of the people you are debating. Science has no authority. Science consists of guessing solutions to problems, that's flaws in current ideas, and critically discussing guesses. Anyone who cites the authority of science is either ignorant of philosophy or intellectually and morally unserious, and this should be pointed out plainly. On the practical side of things, in many (most) cases you actually can't have an effective rational argument in real time against some positions. Many salient beliefs are not held on a strictly rational basis, and not easily/directly changed by rational argumentation. The necessary existence of auxiliary hypotheses isn't the cause of intransigent beliefs, instead it provides the levers by which people can maintain intransigence in the face of rational argumentation. Sometimes, taking a more oblique approach, e.g. addressing underlying concerns like "government takeover of the economy" for climate change or concerns about "big pharma" for vaccines, might be a way to go. One thing to keep in mind is that "everyone who believes the truth, believes the same thing, each person who believes a falsehood believes slightly differently. ", so you need to pay attention to the specifics of the overt beliefs on the topic, and the underlying world view in order to communicate effectively. This aphorism also bears on the (rare) case where you actually are dealing with people who are willing/able to enter into a rational discussion. Then there is the practical difficulty of being able to back up any/all of the auxiliary hypotheses (of which most (almost all?) are backed up by evidence) that your interlocutor may object to. Alice rejects ice cores as a viable record of climatological data? Get your geochemistry hat on. Bob likes the brighter sun theory? Get your astronomer hat on etc. If you are versed in these areas, and your partner is in a mental state to be swayed by rational argumentation, then you might be able to get them to accept the underlying assumptions. If you and they accept the same auxiliary hypotheses, then you'll have to agree on the overall conclusions. In our technologically advanced, and specialized, world it would take years of study to really understands the ins and outs of the actual scientific consensus in a way that can be effectively deployed to try and convince people on these controversial issues. Statistics are not reliant upon having correct meaning in order to be true, and this is the salvation of the experimental method. You can look at existing data, determine what is statistically likely and then explicitly run randomized experiments and determine the odds of your results following the noted trend. This does not validate your theory, but it does verify its predictive power. Your theory is not true. It never will be. That is the nature of science. Successive theories in any domain tend to get more and more different over time. They do not converge to some stable truth. Human creativity and desperation increase along with our observational power. Still, we measure each supplanter's predictive power to explain what we have already observed. And we are safe relying upon the proven predictions. What you are relying upon, in measuring that likelihood is not your set of facts, it is the law of large numbers. The actual facts may be misrepresented, inappropriately framed, of may have many, many other reasons for simply not being true. For example, psychological theories are quite weak, and many generations of different theories along many disparate lines of basic theory have been used to explain the same reproducible outcomes. But the outcomes remain reproducible. And you can argue based upon the outcomes. If vaccination causes autism, then we should see the correlation. Not a retrospective one, but a real correlation in current populations. If you find populations who are not being exposed to the vaccines and are still seeing the same increase in autism, there is no reason to follow that predictive thread. It is not disproven, but it is unsafe to rely upon. Whereas the ability to suppress disease is safe to rely upon. Public policy should be safe. The problem with some of these positions, for example, global warming, is that we cannot run experiments that have real statistical validity. So there really is no version of the argument that is not thoroughly theory-laden. And the kinds of science that produce these arguments have a long history of terribly weak theory and vast, contentious impasses. Geology, the overall science that includes climatology, achieved its "DNA moment": its grand unification as a science, with plate tectonics -- after continental subduction was clearly identified and filled in the remaining holes in the approach. That happened after most of our current legislators had already left school. 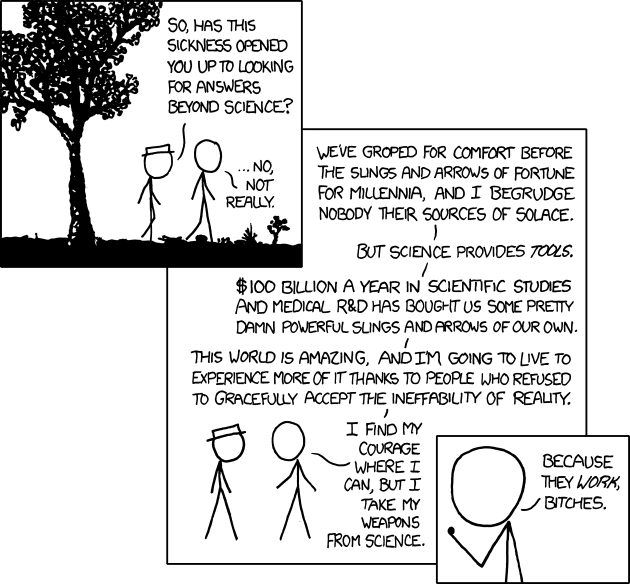 In such a situation, good science needs to have some humility. All we can argue is 'Shouldn't we avoid the possible worst case, especially if the cost is reasonable?' And for some people, the cost is not reasonable. As I understand it, climate change deniers are essentially saying they don't believe the scientists who've produced the evidence, so arguments about the validity of scientific evidence, it's testing and utility do not address the issue. Unless one is the actual scientist who took the measurement, one is making a decision to believe the person who did, even the lead researcher is choosing to believe his small army of students and interns taking the actual measurements. What is relevant therefore is not the evidence itself, but how we choose who to believe when people tell us conflicting information. People are not automatons and to argue that we should simply believe the majority of scientists as if they were computers outputting an answer, would be ludicrous. The conflation of climate change deniers and anti-vaxxers is a classic example of this. The scientists measuring the climate have nothing to gain from reporting that it is warming, they will get paid and be respected for doing their job. Vaccine research, however, is paid for almost entirely by the companies who make money out of vaccines, they have both the motivation and the facility to doctor results to suit their financial ends. It would therefore be entirely rational (not necessarily right, though) not to believe the results of the tests they carry out, so far as such belief does not clash with irrefutable evidence (vaccines obviously do not directly kill people, for example). So to answer the question, argue with a climate changes denier, not on the evidence, but on the question of who has most to gain by lying, the scientists who report warming, or those who report no change. Given that the economy relies entirely on fossil fuels, the answer is obviously the latter, hence we should believe that climate change is real. The argument for vaccines is not so clear cut. A good theory will make the more accurate prediction in situations that have yet to be tested. Einstein's theory of general relativity not only explained all the existing data about the motions of planets in the heavens, it also correctly predicted the amount by which the sun's gravity would bend the light of stars. Einstein's prediction as to the amount of bending was made before the observation ever took place. You can't fudge a theory with additional complexities to explain data that has yet to be collected. It's the same with Copernicus vs Ptolemy: Ptolemy's theory made one prediction about the phases of Venus (Venus has phases like the moon), and Copernicus's theory made a different prediction. At the time, no one had seen the phases of Venus - Venus was just a far, bright, dot in the sky. With Galileo's invention of the telescope, however, we could observe the phases of Venus. And what we saw matched Copernicus, and not Ptolemy. Einstein's prediction of the bending of light was made a few years before the first measurements, and Copernicus's prediction of the phases of Venus was made more than half a century prior to the actual observation that proved his sun-centric model correct. And it's the same with more modern theories, such as quantum physics: so far quantum physics has given us the correct prediction in situations we hadn't tested previously. When our best theories don't match new facts (experimental observations), scientists do produce new theories that match both the new facts and the old ones. But new theories aren't considered solid until they also correctly predict the results of experiments that hadn't yet been tried at the time they were formulated. And even then, scientists constantly perform new tests: we actively try to disprove current theories. If all our attempts at experimental disproof fail, then we have no reason to discard the theory. This is one of the reasons why string theory isn't considered a solid theory, and why it hasn't replaced the standard model: while the parameters of string theory can be adjusted to perfectly match current experimental observations, in any situation we can currently test, string theory will predict almost the exact same thing as the current widely-accepted theory of quantum physics (the standard model), so we can't verify that string theory is better than the standard model. To address climate change denialism: There are three camps. The first camp is the group that say it's not man-made, the second camp says that it is man-made but it's harmless, and the third camp simply denies that any warming is occurring. The first camp ignores the (easily testable) fact that air with a higher concentration of carbon dioxide will trap heat better than air with a lower concentration of carbon dioxide. The second camp ignores the damage a rising sea-level will do and is already doing, and they ignore the damage done by the acidification of ocean water (which is killing off coral reefs). The third camp believes that it's all a colossal conspiracy: they may admit that the data says climate change is occurring; they just believe all data from all sources is fabricated. Please note that denialists often switch camps as is convenient for them to do so. In addition, with respect to the first camp, please note that I have yet to learn of a scientific theory which explains global warming through completely natural causes. Please let me know if one exists. To address opponents of vaccination: I believe this group basically over-estimates the harm done by vaccines and under-estimates the benefit. Sciences are made up of theories, people, institutions. As an outsider, you can ask yourself the question: "Does it work?" I think we all can point to flaws in the medical systems and still acknoledge that generally the scientific institutions do their job, that our knowledge of diseases and treatments is expanding. This cannot and does not disproof that parts of the whole medical sciences screw up on occasion, that wrong meds get pushed etc. So the denier or skeptic needs to explain why the scientific institutions work mostly (If they concede so much! ), but not in this specific case. I think a possible solution might not lie in the truth or our knowledge of the truth of theory-laden theories or hypotheses as much as in their usefulness. Even if everything might be theory-laden, we still get magnificent results from the application of science. Although we can't claim with certainty to have knowledge or knowledge of the truth of phenomena, we can still make predictions and inventions for the sake of their products. In this light, then, we might be able to refute the anti-vaxxer or climate change denier by comparing his predictions and according results with a credible scientist's predictions and according results; the conceptual scheme that made more accurate predictions than the other would then qualify as "better" (albeit not "true"). Then, depending on how inaccurate the results turned out, we should reject the science-denier's theory/hypotheses on the grounds that it would simply be not worth our time. Alternatively, if the anti-science advocate's policies were enacted and harm arose from it, e.g. more and more children would begin to die of polio, then we could use these adverse effects as justification to reject their theory. To put it more simply, we should only accept the scientific community's conclusions on climate change or vaccines if they are more useful to believe. I'm more confident with this solution in the context of the natural sciences, but I would think it would still be applicable in social and political issues as well. Intuitively, I would respond that the relativism of social and political issues could be avoided if we only accepted falsifiable hypotheses, but that solution is obviously off the table. I'm no scholar, and I'm not sure if Quine or Kuhn or any of those you mentioned would even espouse this view, but I still think it is relevant and doesn't clash with theory-laddenness assumptions. First and foremost, we aren't logical creatures, I would like to think we are emotionally-based creatures who use logic when it's convenient for us. Most situations involving policy change based on "factual evidence" is based on a trust of empirical data that most of us have magnanimously accepted without question. Many of us do not question it or even challenge it because many of us aren't scientists or data-gatherers or doctors, yet because we associate these classes with success, we nary ever challenge their data. As for how do we have an actual debate involving policy of our data analysis is flawed? Well, what we often have is a frame collision. Two ideas of different candidates or representatives challenging one another, and each employing scientific methods and ideas. Typically, they go with whichever idea researchers back, and even then they can deny it based on bias of evidence, or logical faculties lacking. But, the state still needs to be run and the people need answers regardless of how wrong they may or may not be. While you are absolutely correct in our lack of factual evidence, the luxury of time to needs of the people's representative ratio go in favor of weaving what may in fact be a clever fantasy. EDIT: If our brains were able to process as quickly as computer but as efficiently as a human's and if the scientific method and knowledge of chemistry, engineering and physics were as simple as 2 + 2 perhaps we would have a chance in reaching this point of society where our evidence does not reach a paradox of factual fallacy. Not the answer you're looking for? Browse other questions tagged epistemology philosophy-of-science sociology social-epistemology or ask your own question. Why do I believe in climate change? Is there a logical way to look at “alternative facts”?